If you enjoy maneuvering between fallen boulders barely far enough apart to fit your inhaled torso, I have a sport for you. Like traditional sports, helmets are mandatory. A steady stance is recommended, seeing as how there are drops of more than 100 feet. And upper body strength is a must. I can testify to this requirement, as I was barely able to lift my arms to type this sentence. However, unlike more traditional sports, an affinity for bats – the flying mammal, not the wooden club – is a plus. I learned these tips and many more while spelunking in the Ozark Mountains of Arkansas. 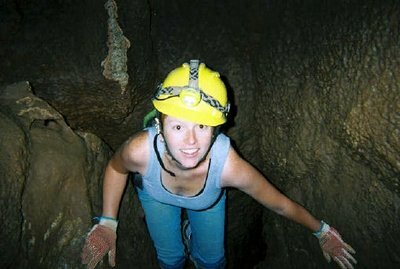 Probably to avoid this exact question, young spelunkers now call it caving, as in to explore caves. 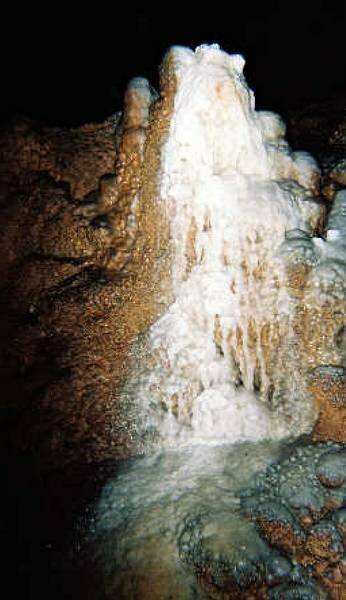 For those of you who have walked on a concrete pathway and stood in awe of well-lit calcite formations while learning the very useful saying, “Stalactites stick tight to the ceiling,” I am sorry to inform you that you are not a caver. But all cavers have their own reasons – not to imply, of course, that I am a caver. Springs’ Wild Cave in Arkansas. I could tell right off that Cannon was happier underground. Who wouldn’t be? That day it was 105 degrees at its hottest on the surface, but the cave has a constant year-round temperature of 58 degrees. Of course, cooling off is not the only reason why caving is enjoyable. But each cave is different and appealing for its own reasons. Blanchard Spring Cavern, like caves in Missouri, Kentucky and Indiana, is a solution cave, formed from the top down by the leaching of calcite from limestone. But in laymen’s terms, Blanchard Springs Caverns is your typical cave with a not-so-typical tour. For me, the fun started as soon as we stepped off the pristine concrete path to the orange clay slope, heading away from the lights and into the darkness. We climbed the first hill relatively easily, for it was dry and graspable. My group of 10, consisting of me, a family visiting their grandma and two locals, then slid down on the other side, hoping desperately not to be the “one” that causes a domino effect, throwing all members into the rocky pit 150 feet below. We had no such rigging, no harness, no safety net, no ropes, and so I wondered why I was not forced to sign my life away before I donned the gear. What is there to say after that? The cave is owned by the National Forest Service. The tour continued for more than four hours, which was enough time for each person to squeeze and clutch and crawl and slide through, under and above the formations of rock, one in particular referred to as the Death Ledge. As we shakily walked upright toward the exit, I found myself wanting to stay, partly to avoid the heat but mostly to see more. I suppose I was bit by the caving bug, which is always better than a caving bat.